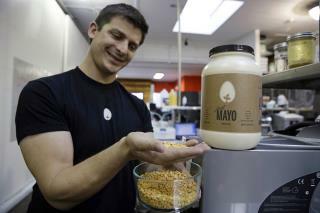 (Newser) – If you're familiar with a company called Hampton Creek, it's likely because of its "Just Mayo" product. It's essentially vegan mayonnaise, with pea protein in place of eggs, though 37-year-old CEO Josh Tetrick hates the connotations of the word "vegan," and industry rivals don't think it technically qualifies as mayonnaise without eggs. If Tetrick has his way, Hampton Creek will expand far beyond mayo, however. He sees Hampton Creek as more of a tech company than a food company—it's been embraced by some of Silicon Valley's biggest venture capitalists—with the idea being to thoroughly explore the science of the plant world to come up with alternatives to animal products in all kinds of food, per a profile by Bianca Bosker in the Atlantic. For example, an egg substitute line called Just Scramble is in the works, as is a longer-range plan for lab-grown meat. A body needs protein. There's a lot of plant based protein out there. It's my understanding that we have a hard time digesting and utilizing plant based protein. Figure out how to cross that hurdle. In the mean time, please pass the cheeseburgers. why the heck are vegans always trying to copy us carnivores? turkey tastes good. tofurky is not needed. Mayo is ok sometimes on french fries. I don't need pea protein based mayo. worry about your own foods and make them good I like hummus it can be used instead of mayo, I do not need pretend mayo. Avocado paste can be used also. tofu can be ok on its own (I prefer meat but for a change I will eat it sometimes) it does not need to taste like turkey. a portabello top on a bun as a portabello burger is great - it does not need to taste like hamburger to be good. I like a lot of vegetarian/vegan dishes... i just think it is dumb when they are pretending to be meat.